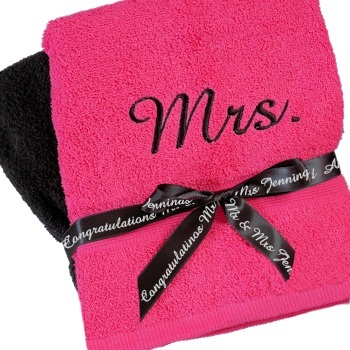 Personalised bath towels a unique gift in fuschia pink and jet black. Personalised bath towels a unique gift in fuschia pink and jet black. Popular for wedding or anniversary gifts and even a great housewarming gift. This set of contrasting colour bath towels are soft cotton and measure 75x125cm. Optional Gift Presentation: You can select to add a personalised printed satin ribbon to your order for a small additional fee. The ribbon comes tied around the towel set and all in clear wrapping. The ribbon can indicate who the gift is to and from or have a brief message such as Happy Anniversary!